It’s the peak of summertime and we could all do with some refreshing drink ideas! Am I right? Mango lassi is a perfect summertime drink choice. It will keep you nice and cool. If you are not familiar with lassi, it’s basically a yogurt-based smoothie. Lassis’ can be salty or sweet, depending on which type you are making. You can make them in a variety of flavors, using mint or different fruits. Mango lassi is a very popular choice, and often it is served with a topping of ground cardamom. For this recipe, you can use whatever type of mango you have. Fresh ripe mango is best, but you can use canned mango pulp or frozen mango as well. A small amount of sugar or honey goes into the lassi, so if your mango is not so sweet, then you might have to add more. You can also add ice if you want a thick consistency to your lassi. 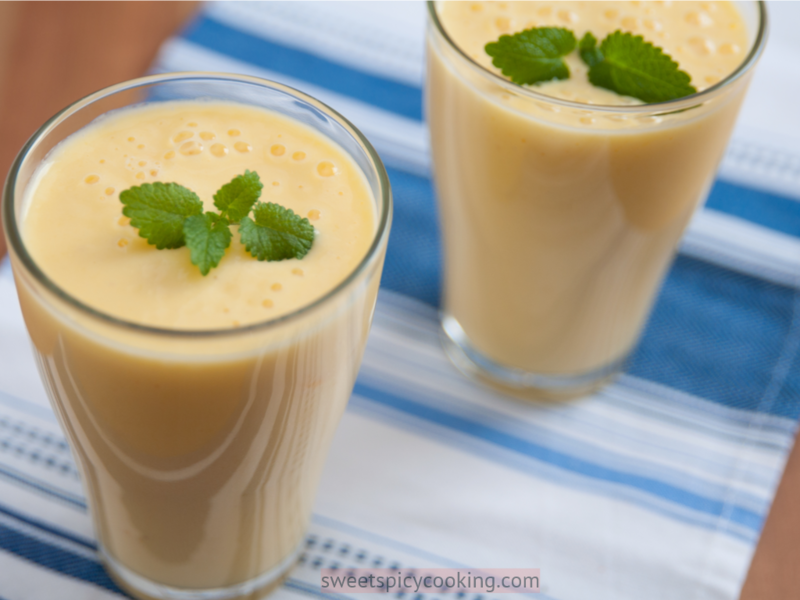 You can top your lassi with a sprig of mint or a few cubes of frozen mango. Let’s start! For another delicious summertime treat, check out these Lemon Ricotta Cookies! Take a blender and add in all of the ingredients: mango, yogurt, milk, and the sugar or honey. Blend them well for 2 minutes. Add some ice for a thicker consistency or leave out if you want a thinner drink. Pour the lassi into tall glasses and serve with ice cubes, frozen mango, a dash of ground cardamom, or a sprig of mint. Your choices! Storage: You should enjoy the lassi right away, but you can store it in the refrigerator for up to a day. Servings: About 2 cups. This recipe can be doubled for a larger batch.